This is a pretty big revelation, and you'll definitely want to tell Bina about it. Is she done with her shower yet? > Wait for Bina to get out, then tell her your deduction. - when she's done. She still knows more about all the weird time stuff then Kendra does. She's only been out there a few minutes though. No rush, and its not like the mud is going anywhere. Yeah, documentation. Kendra walks over to the desk and filing cabinet. The desk is a mess. Not a chaotic mess exactly, more like a mess made while you're in the middle of something complicated. There are a lot of sheets of paper all over the desk in small stacks, most of them contained in manilla envelopes. Looks like maybe Kate and Josh were doing some office work after working on the sandbags when… whatever happened to them happened. Kendra picks through some of the files. They're all handwritten. 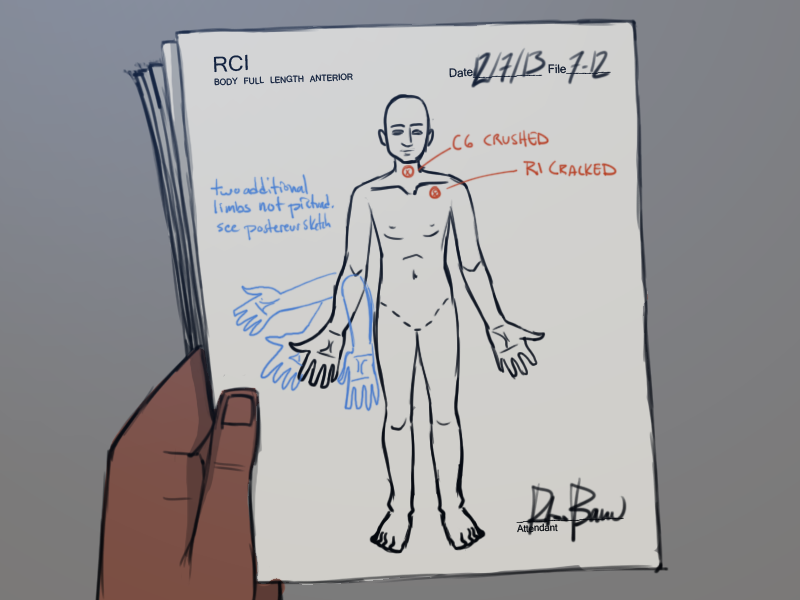 Looks like they were combining the autopsy reports with recovery logs. The style is terse and clinical. 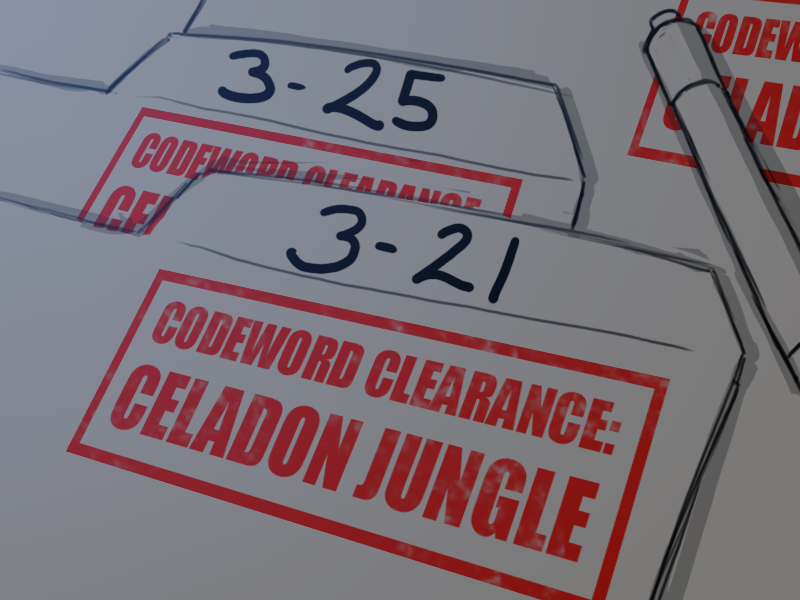 Stamped on the top of all the files is a red box with the words "CODEWORD CLEARANCE: CELADON JUNGLE" on them. Kendra's pretty certain she doesn't have whatever codeword clearance is, but she decides to read them anyway. If the government wants to get shirty at her for reading their stuff she'll deal with that later. She grabs one of the files at random and starts reading the 'summary' section at the bottom of the last page. "Specimen 7-12 found and flagged under light accumulation on second floor of B72 by CJ. Remains in good condition. Some soft tissue remaining, heavily dessicated. Judging by clothing, specimin was male, probably lower-class, eastern european origin. No shoes. Standard skull deformation around orbital sockets, as well as massive polymelia, six instances emerging from below right elbow. See sketch. Fusing of the socket implies that the specimin should have been unable to lift or move his arm while he was alive, yet there is no evidence of the severe muscle atrophy one might expect from such a condition." She flips back a few pages to the sketch. She flips quickly through more of the files. Polydactyly, polymelia again, polymelia, polycephaly. That's when you have two heads, isn't it? Four of the bodies behind her are listed with one level of polycephaly or another. One person, a man in his forties, is listed as having four separate skulls, two of them fused and partially overlapping. "The specimen was found disarticulated and scattered, but even a rough alignment shows without a doubt that all four skulls were part of the same organism. Reconstruction of the multiple skulls connection to the cervical spine will have to wait until they clear quarantine. We lack the facilities here in camp for such delicate work and attempting to do so without proper equipment risks damaging the specimen." The one that stands out among all the extra heads, fingers, arms and legs, is a woman described as having multiple intersecting rib-cages and partial spines. The notes state in the same dry tone, "Specimen 2-4 should never have been able to grow into adulthood as there is not enough uninterupted space in her chest cavity for functional lungs." Yet, specimen 2-4 had grown into adulthood. The chart lists her as 157 centimeters tall and approximately thirty years old. "Anomalous electromagnetic properties. Keep away from vital equipment. Keep away from digital storage media. Keep away from magnetic fields over 50 gauss. (See: David Wangai's Memo on EM Anomalies in CELADON JUNGLE) Do not separate specimen into components. Contain all samples taken with specimen. Observe Level 3 Protocols. Triple bag." Hey everyone, just letting everyone know that I'm sick again. Not strep this time, thank heavens, just viral pharengytus, so updates will be short for a few days. Shows what I get for assuming things are obvious and not making a suggestion pointing them out directly. > Didn't B12 say it was dust? Maybe it's something to do with changes in atomic structure from whatever happens? Wait, it's not… bodies, is it? Like that episode of Fringe where the space ghost trapped in the cosmonaut's body stole the energy from people's atomic structure, turning them to dust? I mean the rules talk about "remains", not bodies, and there are an awful lot of shoes around here. Oh wait, it could also be mostly sugar beets if that's the case, which would explain why there's this much mud. Still. Bodies. Gross. > I still say you need that diary, it could inform you a lot. I don't know how much of the supporting information Kendra knows, but maybe she could figure this out. You do get mad props for this wolftamer! I knew that someone had figured out that the mud was originally dust, and I meant to add that to the last post, but I couldn't -find- it.